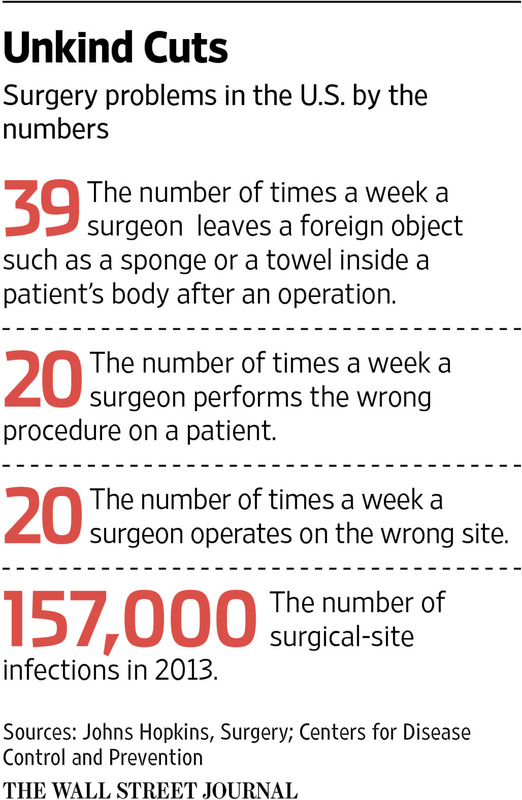 Check out these number from the Wall Street Journal (How to Make Surgery Safer, Feb 16). A little disconcerting, eh? Now there are obviously a lot of surgeries taking place every day in the US, so on a percentage basis having just 20 procedure in which the surgeon operates on the wrong site is very low. Still, that is not very helpful t the person who has a stitches on the wrong side of their body. Much of operations is about standardization. There is much to be gained from building processes that are appropriately tailored to the task at hand and handling that task in the same “best” way every time. And then there is health care, where every patient is unique in some way and doing less is seen as an anathema. There is a very real possibility that not opting not to do some test or some procedure could lead to adverse outcomes for patients. However, not following best practices can lead to excessive cost. The Wall Street Journal provides a nice example from a study at a small hospital system Christiana Care that made a conscious effort to get doctors to stick established best-practice guidelines (Hospitals Cut Costs by Getting Doctors to Stick to Guidelines, Sep 22). The procedure in question is cardiac telemetry, which is a monitoring technique, and how it should be used for patients that are not in an intensive care ward. In cardiac telemetry, electrodes are used to monitor the heart for abnormal rhythms. To try to cut inappropriate use of the monitoring at Christiana Care, which operates two hospitals, a group of physicians redesigned the electronic system that doctors use to order tests and other care. First, they removed the option to order telemetry for conditions not included in the [American Heart Association] guidelines. Doctors could get around this and order the monitoring, but they had to take an extra step to do so, according to Robert Dressler, who helped lead the study. “We didn’t want to get in the way of the bedside clinician who had a demonstrable concern” and wanted to use telemetry despite contradicting guidelines, he said. For all the faults of its roll out, the Affordable Care Act should ultimately provide more people with health insurance and thus a way to pay for basic health care. That implicitly assumes that there is enough health-care capacity to go around. There is a very real concern that there is not enough capacity — particularly in primary care — to properly cope with an influx of newly insured patients who will want to do basic things like see a doctor. If capacity is going to be tight, then there is a premium on making sure it is not wasted. That, as Marketplace reports, means that clinics are experimenting with overbooking (How post-ACA health care is like the airline business, Dec 5). Cooper University Hospital is expecting a huge wave of patients starting next month, as millions of consumers get health insurance, some for the first time. The question for hospital executives in Camden, and around the country, is how to manage this new population. For one, there is a chance this new patient population will exacerbate existing problems at Cooper. Today, “the patient no-show rate is in high 20s, 25, 30 percent,” says Jonathan Vogan, the associate director for financial and performance measurement at Cooper’s outpatient clinic, the Urban Health Institute. The Urban Health Institute serves more than 8,000 patients, virtually all of them low-income. Vogan says the poorer the patients, the more likely they’ll miss their appointments. And that’s an expensive problem. But Vogan says the solution is simple. “If not all of your patients show up then the easiest thing to do is, well, just book more of them,” he says. What explains the price of a flu vaccine? It’s been a bad flu season with hospitals in many cities overwhelmed with patients. This is largely a preventable problem. The annual flu vaccine is not perfect but a wider use of the vaccine would provide some amelioration. So why don’t more people get a flu shot? Some reporter at the LA Times seemed to think that cost might be a factor (Why does a flu shot cost so much?, Jan 21). After all, getting the shot at your local pharmacy will set you back $30 or so. However, as the reporter found out, given the supply chain challenges of producing and distributing influenza vaccines, the real question is why flu shots cost so little. This year, companies have produced about 145 million doses, he said. Only about 129 million have been distributed. Last year, companies lost even more on the flu vaccine because it was such a light flu season and fewer people decided to get the shot. Only about 42% of the U.S. population got an influenza vaccine last year, which meant that about 30 million doses were never used and had to be destroyed. Over the years, we have had several posts applying lean operations to health care (see, for example, this or that). However, we have yet (I think) to post anything on Virginia Mason. Despite what its name might suggest, Virginia Mason is located in Seattle and has long been known as a leader in taking lessons from Toyota and applying them to health care. Now, in the form of a report from PBS’s NewsHour, we have an excuse to remedy that oversight (Rooting Out Waste in Health Care by Taking Cue From Toyota Assembly Lines, Oct 24). Check it out! The New Yorker has a profile of Federico Marchetti and his company Yoox (The Geek of Chic, Sep 10). Yoox does a couple of things. It started by selling end of season luxury fashions. It won friends in the industry by just posting their own price with noting how much it was discounted off the list price. Luxury brands liked that this allowed them to unload unsold items without tying their brand to a 50% off sign. The interesting part is that Yoox was able to provide the brands with information they never had before (like what colors were selling where). Yoox has since expanded and now provides the backend and fulfillment for multiple designers’ web stores. At a different end of the market, Wired had an interview with Yasunobu Kyogoku, the COO of Uniqlo USA, which is ramping up a big US expansion (Upending Fashion, Steve Jobs-Style: 10 Questions With Uniqlo’s Yasunobu Kyogoku, Aug 31). Uniqlo has a very different approach from, say, Zara. Wired: Is it true Uniqlo orders from its suppliers a full year in advance? What’s the thinking behind that? Kyogoku: Let’s say you happen to own your own factory, and someone says, ‘In September, I’d like to order 40% of your capacity; in October, 70%; in the rest of the year, zero.’ You’d say, ‘But there’s a gentleman who just came to me and said, ‘I will book 80% of your capacity for a year and in fact, let’s do a long term partnership. Why don’t we add an extra line?’ The more you produce, the more you help me reduce the cost. We pass that to the customer. The customer buys more. We have a positive cycle where everyone wins. Wired: With a 12-month cycle, aren’t you worried customers will go to faster-moving competitors with trendier clothes? Kyogoku: We don’t chase trends. People mistakenly say that Uniqlo is a fast-fashion brand. We’re not. We are about clothing that’s made for everyone. A recent New Yorker article by Atul Gawande has gotten a lot of attention (Big Med, Aug 13). The article is built around an intriguing observation: The Cheesecake Factory can churn out a high variety of dishes at consistently decent quality at reasonable prices across more than a hundred locations. The question then is whether healthcare providers can learn anything from the Cheesecake Factory? The managers had all risen through the ranks. This earned them a certain amount of respect. They in turn seemed respectful of the cooks’ skills and experience. Still, the oversight is tight, and this seemed crucial to the success of the enterprise. The managers monitored the pace, too—scanning the screens for a station stacking up red flags, indicating orders past the target time, and deciding whether to give the cooks at the station a nudge or an extra pair of hands. They watched for waste—wasted food, wasted time, wasted effort. The formula was Business 101: Use the right amount of goods and labor to deliver what customers want and no more. Anything more is waste, and waste is lost profit.